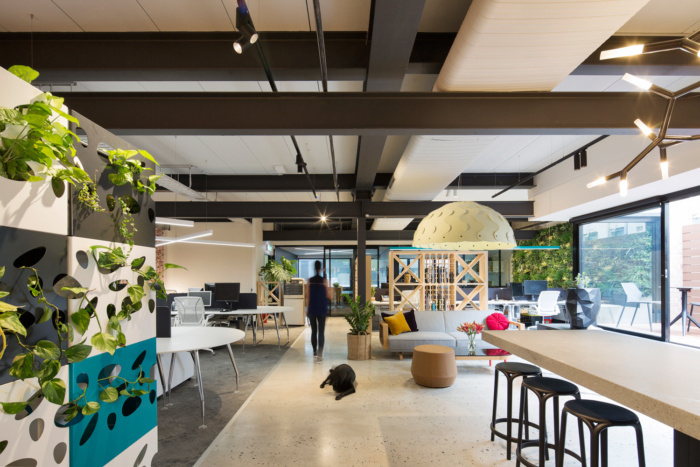 rfa Architects have designed their new creative offices located in Sydney, Australia. This ethos influenced everything, starting from the internal layout of the office and the removal of the traditional reception desk so that all clients, consultants and visitors enter directly into the ‘engine room’ and become part of the mechanics and culture of RFA. There is no back of house, nor front of house, and indeed many visitors are often greeted at our centralised kitchen. Typical of many modern designs our kitchen provides an essential hub – a meeting place for staff and more importantly, meetings with clients, consultants and anyone else crucial to the process. First time visitors are often intrigued by the large cantilevered kitchen benchtop, especially within it’s context of the sun-drenched timber decked courtyard and adjacent lounge and coffee table setting. This cosy residential setting is juxtaposed against the commercial office workstations and brutalist industrial steel structure that was surprisingly, yet fortunately revealed as the previously existing ceilings and dated fit-outs were stripped out. The grinded polished concrete floor enhances the industrial feel, whilst the juxtaposed herringbone-laid carpet tiles soften the space and enhances the residential character of the office. The utilities and printing room is always a very heavily used area in any architects’ office and is therefore most practically located in a centralised position. The challenge however, is one of aesthetics. Enter a contemporary bright red and white layout table disguised as a pool table, or a pool table disguised as a layout table? perhaps it depends on what time of the day or night it is being used! The contrast of the pool table against the wall-hung sporting memorabilia and suspended heavy rustic recycled beam wrapped in vintage lights makes even the utilities area a cool and desirable place to hang out. Creating multi-functional spaces was a key consideration to a more efficient use of office space. Somewhat similarly to the utilities room, the boardroom also has a dual use, it houses a bespoke black table designed by the interior designers in-house. The black table top incorporates a subtle matt black thin cross dividing the table into quadrants. Perhaps this subtle line down the middle gives away this ping-pong table’s secondary use as the company’s boardroom table. The tan leather board chairs break up the boardroom’s monochromatic design with the black linear woven vinyl floor, black magnetic chalkboard and the grey acoustic pin boards. The magnetic chalkboard is a playful feature, and it is always of interest to see what the latest cartoon drawings or quote of wisdom is! The extruded marker shelf more often carries a number of ping-pong pats and balls, and it is certainly not rare for a business meeting to disintegrate down into a game of ping-pong! Aside from the pool table and ping-pong table, It was important to the directors that the space was personalized. Both directors, Andrew Ip and Brian Hollis brought sentimental belongings into the office, including Tonka Trucks owned by them as kids, and Brian’s father’s tool boxes and vintage tools. The vintage petrol bowser has also been a long-standing icon of RFA and has moved with them from office to office. The petrol bowser provides a welcome to visitors as they pass through the teal coloured residential entry door, and it is the same teal also used as a subtle feature colour on suspended linear lights, and the internal vertical planting walls. The subtle colours offset the industrial columns and monochromatic variations of grey used throughout the fit-out. The greenwall near the entry provides a focus to visitors as they enter the office, and a backdrop behind the wine racks and planterboxes that have been strategically used to softly define and separate spaces within the office. This whole floor, 300m2 office makes ideal use of the great natural amenity of natural light and ventilation entering on 3 sides, and in fact all the previous fixed windows were removed and replaced with openable windows for ventilation. This has resulted in a workspace that is appreciated by staff and clients whilst showcasing the architect’s and interior-designer’s abilities to create truly inspirational designs.